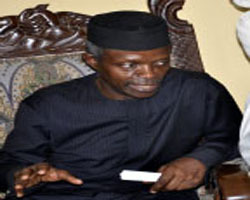 Vice-President Yemi Osinbajo yesterday visited the first Executive Governor of Lagos State, Alhaji Lateef Jakande, at his Ilupeju home in Mushin Local Government Area. The vice-president, who held a closed-door meeting with the former governor and his family, was in Lagos for the continuation of his door-to-door campaign ahead of the forthcoming general elections. He was accompanied by the stateâ€™s All Progressives Congress (APC) governorship candidate, Mr. Babajide Sanwo-Olu, House of Representatives Majority Leader Femi Gbajabiamila, Senator Ganiyu Solomon and the Speacial Adviser (SA) to the President on Political Matters, Senator Babafemi Ojudu, among others. The vice-president was ushered into Jakandeâ€™s home by a huge crowd of party supporters in APC uniform. They chanted the praises of President Muhammadu Buhari and Prof Osinbajo. Solomon, who addressed reporters on the visit, said APC was sure of victory, despite the blackmail by its traducers. The senator said Nigerians have seen the partyâ€™s performance in the last four years, adding that its people-oriented programmes have endeared the party to the people. According to him, despite the performance of the APC, its candidates have been campaigning vigorously to showcase the partyâ€™s achievements and convince the electorate to vote for continuity. Osinbajo also visited some party leaders in Mushin and major markets in Mushin and Surulere local government areas. In Surulere, Osinbajo said APC will take Nigeria to greater heights. He urged the electorate to vote massively for the party in the February 16 and March 2 elections. â€œAPC is taking Nigeria higher and higher. We are not stopping. Our country is going higher. Come February 16, vote for APC,â€ he said. The vie-president also urged Nigerians to vote for all APC candidates in the February 16 and March 2 polls. Also, Gbajabiamila urged party members to unite and work for its success in the forthcoming elections.